Real-time financial journalist by day. Lived all over the world. Enjoy reviewing new and exciting things to do in London and elsewhere. It's not often that London gets hit with a heatwave but when it does, there is bound to be a line stretching outside the door of Gelato Mio in St Johns Wood. With no other major vendors of creamy cold stuff in the St Johns Wood area, Gelato Mio brings the punters in with its offerings of Italian flavours such as Stracciatella (choc chip) and Bacio (hazelnut and chocolate). There are also fruity sorbets on offer, including strawberry and watermelon. 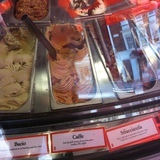 During the World Cup, Gelato Mio also offered flavours representing each of the countries playing; for example, there was Black Forest for Germany. In fact, this flavour must have proved popular because it appears to still be on offer. For those watching their figures, it is interesting to note that gelato supposedly has less fat than ice cream, on average 50-60% less. It has to be said, though, that the taste factor is not compromised in any way. Gelato Mio is first and foremost a vendor of Italian ice cream but also serves treats such as cookies, cakes, coffees and waffles. Why? Ideal place to visit in the summertime! Their hot chocolate here is wonderful, proper thick velvety melted chocolate. Rich and tasty. Their ice-cream however is a bit hit and miss. Some of the flavours, Chocolate and the surprisingly good Banana and Kiwi are spot on, however others, honeycomb etc are pretty tasteless and dissapointing. Staff are however lovely; friendly, helpful and accomodating.